Charming, bright and sunny, rent this fabulous two bedroom house located RIGHT ON THE BEACH, just steps from the water. 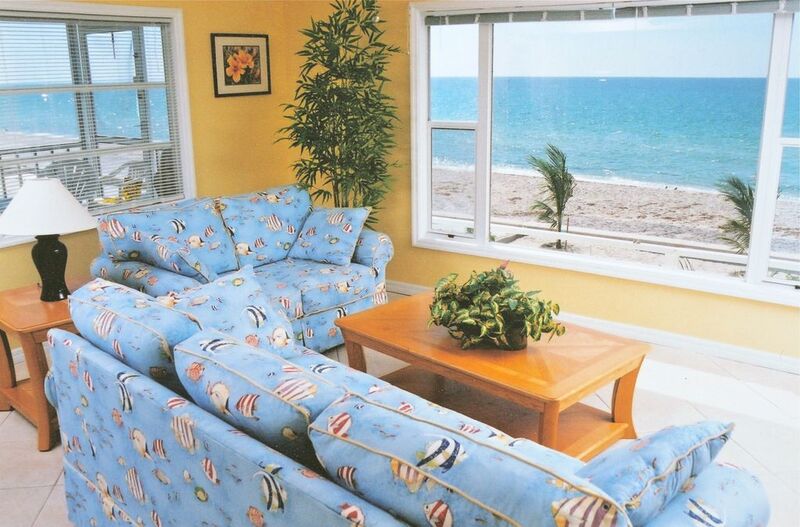 Enjoy the million dollar views and watch the dolphins play from your living room window! Outside, relax on your own beach. This unit is beautifully furnished; you'll feel right at home! Be enchanted with this island where there are no high rises, no traffic lights and no crowds. A two lane road runs the length of the island with pristine beaches on the west side and Lemon Bay on the east side. We are just steps from Stump Pass state park and wildlife sanctuary where you will discover a pristine, uninhabited shoreline. Shops, restaurants and boat rentals within walking distance. Grocery shopping, more restaurants and golf courses all just a short drive away. HI! We're your hosts, Jon and Sally Bruggeman. Our family loves our beach house and we know you will, too! Welcome! We bought this house in 2002 because we love the location on the beach. The state park is within walking distance and you can walk to restaurants, too. The whole area is relaxed and laid back. Best of all, you are surrounded by nature! This house has 3 separate rental units. If you have more than one or two families, we can accommodate everyone! Just send me an email to find out more. The accommodations were welcoming, spacious, and immaculate. The location on Mannasota key was absolutely gorgeous. Thank you for an awesome vacation! My wife and I really enjoyed the stay. The owners were very responsive to our inquiries. The upstairs unit where we stayed was very clean and well maintained. Access to the ocean and beach were right out the front of the unit as the online photos show. Great stay and will definitely try to get down there again. The 2 nd floor condo was very clean and had a nice screen area to enjoy the views and get out of the sun for a bit. We would stay here again when we return. Sally made sure we had everything we needed. Being right on the gulf and enjoying the beautiful sunsets was perfect! This was a great place to stay. Came down with a friend to escape from St Louis winter if only for one week. We enjoyed our stay, the place was clean and quiet with a great view of the gulf and beautiful sunsets.